NEW YORK (Human Rights Watch) – New evidence has emerged that the Syrian air force has used cluster munitions in recent days, Human Rights Watch said today. Many of the strikes were near the main highway that runs through Maarat al-Nouman, the site of a major confrontation between government and rebel forces this week. Videos posted online by Syrian activists on October 9-12 showed cluster munition remnants reportedly in or near the towns of Tamane’a, Taftanaz, al-Tah, and Maarat al-Nouman, in the northern governorate of Idlib, Eastern Bouwayda and al-Salloumiyeh in Homs governorate, Tel Rifaat in Aleppo governorate, the countryside in Latakia governorate, and Eastern Ghouta, near Damascus. The cluster bomb canisters and sub-munitions shown in the videos all show damage and wear patterns produced by being mounted on and dropped from an aircraft. Residents from Taftanaz and Tamane’a confirmed in interviews with Human Rights Watch that helicopters dropped cluster munitions on or near their towns on October 9. Human Rights Watch does not yet have any information on casualties caused by the recent cluster munition strikes. Human Rights Watch is deeply concerned by the risks posed by the unexploded sub-munitions to the civilian population, as men and even children can be seen in the videos handling the unexploded sub-munitions in life-threatening ways. Syrian activists have posted at least 18 videos on YouTube showing the aftermath of the cluster munition strikes in recent days. They are the latest in a continuous stream of videos showing ongoing fighting, and the Human Rights Watch interviews with residents of two of the affected towns corroborate the use of cluster munitions. Eliot Higgins, who blogs on military hardware and tactics used in Syria under the pseudonym “Brown Moses,” compiled a list of the videos showing cluster munition remnants in Syria’s various governorates. Human Rights Watch reached residents in Taftanaz and Tamane’a who confirmed the strikes on their town, but has not been able to reach residents in the other towns featured in the online videos. Human Rights Watch has confirmed that the remnants shown in the videos are RBK-250 series cluster bomb canisters and AO-1SCh fragmentation bomblets. Jane’s Information Group, a publishing company specializing in military topics, lists Syria as possessing RBK-250/275 and RBK-500 cluster bombs. These cluster bombs and explosive sub-munitions are Soviet-made, but there is no information available on how or when Syria acquired them. In July, Human Rights Watch identified an RBK-250 series cluster bomb canister and AO-1SCh bomblets, apparently found in Jabal Shahshabu, Hama province, from a video. Video footage posted in August from Talbisah in Homs governorate and from Abu Kamal in Deir Ezzor governorate also show cluster munition remnants. The August cluster munition strike on Abu Kamal appears to have involved a different type of sub-munition, the PTAB 2.5M, which is an anti-tank bomblet. A resident of Taftanaz told Human Rights Watch that Syrian forces had been attacking the town for the past six weeks and that on October 9 a helicopter “dropped a [bomb] and as it fell it broke into half and released smaller [bomblets]. I heard one [initial] explosion. But after the sub-munitions were released I heard several [further] explosions.” The strike hit a field of olive trees south of Taftanaz, two to three kilometers from the airport. There were apparently no casualties. The resident said he saw around 30 unexploded bomblets when he went to the site. Another resident of Taftanaz interviewed separately described another cluster strike north of the town. On October 9, I heard a big explosion followed by several smaller ones coming from Shelakh field located at the north of Taftanaz. We went to see what happened. We saw a big [bomb] cut in half and several [bomblets] that were not detonated. I personally found one that was not exploded. There were small holes in the ground. The holes were dispersed and spread around over 300 meters. According to the resident, soldiers from the rebel Free Syria Army informed him that 20 unexploded bomblets were found in Taftanaz. A video posted online on October 10 clearly shows remnants of an RBK-250 cluster bomb and AO-1SCh bomblets at al-Tah, another location near Tamane’a. These unexploded sub-munitions are armed and can explode at the slightest touch or movement, yet civilians can be seen in some of the videos carrying the sub-munitions around, banging them on objects, and throwing them on the ground. A video filmed at Tamane’a shows several men handling unexploded AO-1SCh bomblets, an act that is extremely hazardous. A Tamane’a resident told Human Rights Watch that people have been taking the bomblets and remnants as “souvenirs.” In a separate video from August, a young child is filmed holding an unexploded sub-munition. Human Rights Watch also called on television stations widely watched inside Syria, such as al-Jazeera and al-Arabiya, to run announcements alerting the population to the risks of handling these munitions. Cluster munitions can be fired by rockets, mortars, and artillery or dropped by aircraft, including helicopters. They explode in the air, sending dozens, even hundreds, of sub-munitions or “bomblets” over an area the size of a football field. These bomblets often fail to explode on initial impact, leaving duds that act like landmines and explode when handled. 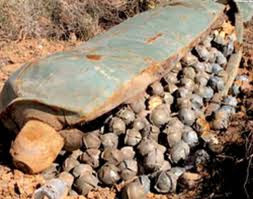 A majority of the world’s nations have comprehensively banned the use of cluster munitions through the Convention on Cluster Munitions, which became binding international law on August 1, 2010. Syria is not a party to the convention and did not participate in the 2007-2008 Oslo Process that led to the creation of the treaty, which bans cluster munitions and requires clearance of contaminated areas and assistance to victims. A total of 77 countries are party to the Convention on Cluster Munitions while another 34 have signed but not yet ratified. Human Rights Watch is a founding member of the international Cluster Munition Coalition, the civil society campaign behind the Convention on Cluster Munitions.